Bill Garrett was short for a center. 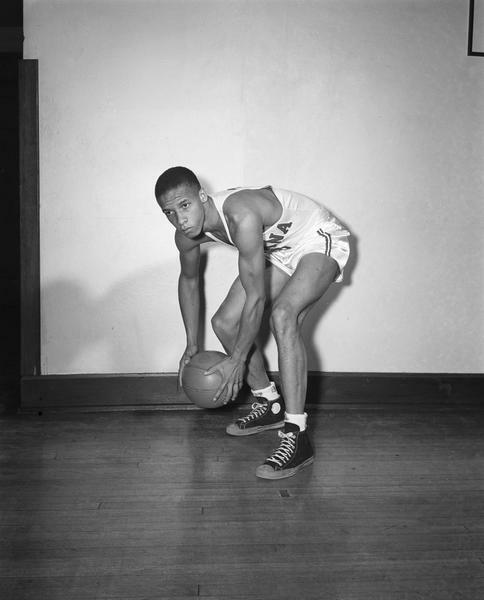 It didn’t stop the 6’2’’ basketball player from setting new scoring and rebounding records while he played for IU’s varsity team from 1948 to 1951. Garrett was black, and 1950s racial attitudes didn’t deter him from breaking the unofficial gentleman’s agreement among coaches that barred black players from playing in the Big Ten. The Indiana Historical Bureau and IU will honor Garrett’s legacy and influence on the University with a state historical marker. The marker will be unveiled 11 a.m. Saturday with a reception in Alumni Hall that will feature speakers including Provost Lauren Robel; Tom Graham, who authored a book on Garrett; and Billy Garrett, Garrett’s son. The marker will permanently reside just off the corner of North Forrest Avenue and Seventh Street outside the School of Public Health building and the gym, formerly known as the Fieldhouse, where Garrett played basketball. The Fieldhouse today is the Ora. L Wildermuth Intramural Center. Wildermuth was a judge from Gary, Indiana, who dedicated much of his life to IU. He served on the IU Board of Trustees for 27 years, was the president from 1938 to 1949 and worked to have the Fieldhouse built. He was also a segregationist. Wildermuth’s tenure as board president overlapped with about two years when Garrett played basketball at IU. “The only way to assure the perpetuity of the white race is to keep it absolutely pure in so far (sic.) as the colored race is concerned,” Wildermuth wrote. Some have noticed the inconsistency of honoring IU’s first black basketball player in a place named for someone who was pro-segregation. “It’s a painful irony,” said Rachel Graham Cody, author of “Getting Open,” a book about Garrett’s life. Graham Cody and her father, Tom Graham, wrote the book together. Graham and Bob Hammel, former sports editor of the Herald Times, started working with the Indiana Historical Bureau in 2015 to get the marker and decide where it should be placed. “We chose the Wildermuth Center because that is where Bill Garrett played, and so it is the only appropriate place to put it,” Graham said. They were fully aware of Wildermuth’s name on the building and the incongruity it presented, Graham said. “But if that is a problem, then the issue is the name of a racist on the building not the placement of a marker commemorating a historic breakthrough for integration that occurred there,” Graham said. Junior Grant Prather said he didn’t know Wildermuth was pro-segregation. Prather is the president of Kappa Alpha Psi, a historically black fraternity that Garrett was a member of at IU. “It goes to show how tough it was for men of color to be able to get that position of influence and also how still prominent these kind of systematic issues are today,” Prather said. There is still work to be done to make IU a campus that is more suitable for minority students, Prather said. Prather knows the power of a name. In 1911, when Kappa Alpha Psi was started at IU, it used to be called Kappa Alpha Nu but was renamed when people called athletes from the fraternity Kappa Alpha racial slur during competitions. This isn’t the first time the Wildermuth name has come into question. The IU Board of Trustees voted Feb. 20, 2009, to rename the center the William L. Garrett-Ora L. Wildermuth Intramural Center. Four days later, the University decided not to go through with the name change because members of the Garrett family did not support it, according to University press releases. “Being outside the Wildermuth should just raise more conversation and get people to realize people like Bill Garrett,” Prather said. Casey Pfeiffer is in charge of the historical marker program at the Indiana Historical Bureau and said the incongruity speaks volumes and touches on Garrett’s significance even more so. For those who dislike Wildermuth’s sentiments, the issue remains no matter where the Garrett marker is, Graham Cody said. “I would hope that IU would be open to at least considering a renaming of the Wildermuth Center,” Graham Cody said. Garrett wasn’t always destined to play basketball at IU. Coming off a state championship win with his Shelbyville High School team and earning the Mr. Basketball title, Garrett still wasn’t recruited by any majority white schools. So he packed his things and headed to Tennessee State University in Nashville, Tennessee, but Faburn DeFrantz had other ideas. DeFrantz was the director of the Senate Avenue YMCA, which at the time was one of the largest African American YMCAs in the country. DeFrantz was a strong advocate of integration, so he assembled a team of influential black community members and met with Herman B Wells to make Garrett’s case. McCracken said if Garrett was on campus, he would let him try out. Garrett got on a bus in Nashville and made his way to Bloomington. Garrett’s talent was undeniable. He was a walk-on to the freshman team and became the best player IU had, Graham Cody said. The freshman team would warm up before the varsity. Garrett sometimes drew a larger crowd for the pre-show than the actual game. As a sophomore, he made the varsity team. Garrett set new scoring and rebounding recordings, he averaged 13.1 points per game in his senior season. IU’s current center, Thomas Bryant, averaged 12.6 points per game this past season. When Garrett played in the late 1940s and early1950s, games were lower scoring. Garrett was honored again for his outstanding performance, he became an All-American as a senior. While he was at IU, the dorms, cafeteria and the Indiana Memorial Union integrated. Black students began attending basketball games when Garrett played, and were able to be more involved on campus because of integration, Graham Cody said. “He dealt with all the difficulties that went along with being the first incredibly graciously in a way that never gave an excuse to any sort of racism or arguing for segregation,” Graham Cody said. Garrett’s role on IU’s team had greater implications for black people and segregation in the United States. “At a time when unemployment was high for African Americans, when there was a real housing crisis, when there were still quotas for university and law schools, having someone to root for was an important thing,” Graham Cody said.